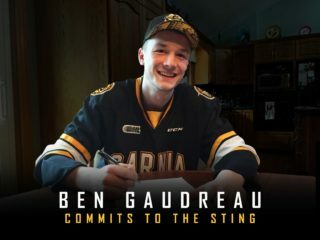 The Sarnia Sting visited the Owen Sound Attack on Wednesday night. It was our first visit of the season to the Harry Lumley Bayshore Community Centre. Right off the opening puck drop, the Sting dominated early. Sarnia forward Sean Josling scored his first goal of the year just a little over one minute into the game. Using some swift around-the-world puck movement, the always-dangerous Adam Ruzicka sent the puck low to linemate Hugo Leufvenius. With Josling creating space in front, Leufvenius dished the puck tape-to-tape, and Josling buried it. It was 1-0 for Sarnia. Ruzicka remained a threat throughout the first period, creating multiple odd-man rushes following Josling’s opening tally. Owen Sound forward Mitchell Russell snuck two pucks past Sting goaltender Aidan Hughes before the end of the first period. After one, the Attack held a 2-1 lead. In the second, the Attack added another pair of goals from overage forward Kevin Hancock. Midway through the middle frame, it was time for a milestone. Sting rookie forward Theo Hill scored his first Ontario Hockey League goal. Hill used his stick to knock down the puck from mid-air as he crossed the offensive blueline. And then he sniped. 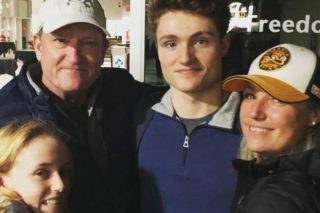 Hill was a fifth-round pick, ninety-ninth overall in this past spring’s 2018 OHL Priority Selection. Check out his goal below. Owen Sound forward Alan Lyszczarczyk snuck one through Hughes before the end of the second period. After two, the Attack held a 5-2 lead. Moving into the third, Sting goalie Ethan Langevin replaced Hughes between the pipes. Langevin made some stellar stops on the penalty kill throughout the final frame. Langevin also made a late breakway save on Hancock. With a scoreless third period, tonight’s final score was 5-2 for the hosting Attack. Hughes stopped thirty-five of forty shots faced. Langevin stopped ten-of-ten in the crease. Tonight’s official box score can be viewed here. We return to action on Friday night in Guelph against the Storm. Puck drop is 7:30 PM at the Sleeman Centre. We will be back home on Saturday night to host the Kitchener Rangers! Make sure to get your tickets below for an always entertaining battle with the Blueshirts.